The latest Vienna meeting between the Azerbaijani and Armenian leaders has not put a threat of a new war for the liberation of the occupied lands in Karabakh and around on a back burner, on the contrary, the post-meeting statements by officials in Yerevan have moved it on the front burner and strengthened concerns that a new and final stage is unavoidable. The war in Karabakh is not over, but its first phase, the Azerbaijani president said on April 2, speaking to a group of officers of the Special Forces. 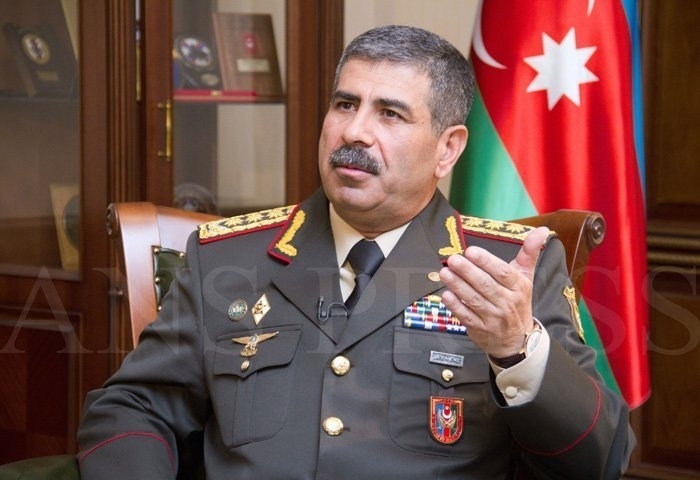 “The victory in the April war was the result of the economic development and army building policy carried out by President Ilham Aliyev,” Defense Minister Col-Gen Zakir Hasanov told the state-owned AzTV channel. The Armenian statehood collapsed as a result of the April war of 2016, the defense minister believes: “However, following the April war, military experience and patriotic spirit of the Azerbaijani army has got greater,” Hasanov opined. The defense minister also added that the army has all the means to increase combat readiness: “Our state is doing its best to keep combat readiness of the army. Today, Azarsilah, Azeri weapon, enterprise with the output of over 1,000 weapons and armament, fully meets the need of the Azerbaijani army. We have no concern for the supply of weapons now and should not be in the future. Thus, we can start fighting at any time to liberate our lands from occupation," the general said. The likelihood of a war to start any time is also shared by the former foreign minister of Azerbaijan, Tofiq Zulfuqarov. The Azerbaijani public is well aware that it is impossible to liberate the occupied territories through negotiations, the former foreign minister of Azerbaijan, Tofiq Zulfuqarov, said in a comment on the results of the March 29 meeting between Ilham Aliyev and Nikol Pashinyan. The former foreign minister slammed Armenia for reluctance to liberate the occupied lands and thus pushes the sides to a new bloody war. The reason for this is the position of Armenia, which does not want to liberate the occupied lands, he added. "In such a situation, negotiations cannot benefit. As for international organizations, they think a bad peace is better than a good war,” the pundit opined. Therefore, war can start war at any time, Zulfuqarov believes. As for the statement of the OSCE Minsk Group co-chairs, calling for measures to strengthen the cease-fire regime and resolve humanitarian issues, Zulfuqarov is certain that the mediators want to show that they are taking some real steps and intend to resolve some issues. “Azerbaijan’s interest is in freeing our territories from captivity,” he said. The former minister also assessed the Vienna meeting as fruitless. "With this in mind, we can state that the result of the Vienna talks was that no results were achieved," Zulfuqarov added. Pundit Eldar Namazov is also confident that Armenia’s Nikol Pashinyan is under strong internal political pressure and tries to look more radical than his predecessors - Robert Kocharyan and Serzh Sargsyan. In his opinion, Pashinyan loses public support on daily basis; the media, which previously encouraged him, carry articles directed against the head of government, the number of critics of the Armenian prime minister grows, and his team is called incompetent, made up of people who came from the street. Under such circumstances, Pashinyan is afraid of conducting any serious negotiations with Azerbaijan to discuss the peace process. “There is also a serious campaign against him in the Karabakh issue. Today, Pashinyan is afraid of repeating the theses voiced by Kocharyan and Sargsyan. The latter, in his speeches, has repeatedly said that the occupied territories around Nagorno-Karabakh do not belong to Armenians. He has a well-known saying that Agdam is not the birthplace of Armenians. From time to time both Kocharyan and Sargsyan made such messages and assured the co-chairs of the Minsk Group that they are ready for concessions and compromises. However, today public opinion does not allow Pashinyan to do the same. Therefore, Pashinyan is trying to look more radical and thereby compensate for his failures in the social, economic sectors and in governance,” Namazov said. At the same time, Eldar Namazov continued, the Armenian leader understands that this tactic is effective for the internal audience, but not for the external one. After certain hiatus, the European Union and the OSCE demonstrated rigidity to Pashinyan, forcing him to agree to the Vienna meeting. “Pashinyan was afraid that after this meeting he would face pressure. Therefore, in order to divert public attention, he instructed the minister of defense to make a delusional statement that ‘Armenia will start a war for new territories of Azerbaijan’, Namazov added. Asked if Tonoyan’s statement was agreed with Moscow, with which Yerevan improved relations in recent months, Eldar Namazov said that the Pashinyan government is a pro-Western model; if we draw parallels with Russia, we can see similarity to the model of Aleksey Navalny. Therefore, the expert believes, Russia is not at all interested in the success of such a project in Armenia. Nikol Pashinyan also announced steps that would irritate Russia. In other words, there is pressure from the Kremlin. To compensate for this, Pashinyan picked up the Karabakh topic. This topic plays the role of a lifeline for the Armenian leader, through which, he, among other things, wants to improve relations with Russians. That is why he delegated his foreign minister to Moscow ahead of the Vienna meeting, and after it, he phoned Putin and told him the details. That is, Pashinyan wants to show that he will not take steps in this direction without the consent of the Kremlin, he noted. The Azerbaijani top brass also added that the army uses experience of countries in the state of war. “Personnel reform was one of the main directions. The reform focused on training. Much work has been done in this direction,” Zakir Hasanov said. “Conditions must be created in various training centers and military schools. This includes issues of study abroad, exchange of experience. In all these areas, reforms have been carried out and are continuing. We even use the experience of states that are in a state of war, in particular, the experience of fraternal Turkey,” the defense minister concluded.